Finally got back to paradise today, a.k.a Valla Beach. The sun was as hot as standing under the grill, and the golden sand was like running across a fry pan, but the water was perfect. 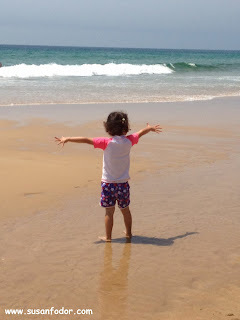 When we arrived Little Miss ran out in front and stretched her arms out as though she wanted to hug the whole coastline. She embraced the sizzling sand and the frightening waves and relished every second of the beach experience. I need to have the same attitude with life. Enthusiasm and passion for living is never a waste. My challenge today is embrace life, savour every experience. You will never regret choosing joy and passion.